We hear of cosmetics collaborations all the time these days, but how often do you hear of a cosmetic collaboration with a … water company? Riiight. Not just any water, mind you. This is the Icelandic Glacial Water company, where the source of the bottled water comes from Iceland’s Ölfus Spring, one of nature’s largest natural springs where the water has been filtered through volcanic rock. The key distinction of this water, other than the fact that its one of the purest in the world, is the high alkaline content with a PH8.4 apparently. And how is this relevant? Apparently, alkaline water is good for us, to balance the acidity of our skins. The 2012 version of the Diorsnow skincare range contains Icelandic Glacial Water with its alkaline goodness that is said to be better for our skin. Combining the water with the Diorsnow technology, the results are supposed to be clearer more translucent, radiant complexion. Wow. I’ve got some pictures below as well, of the Diorsnow makeup range which, as the name implies is shimmery and icey in design and feel. A very pretty ethereal type collection. But first the skincare. 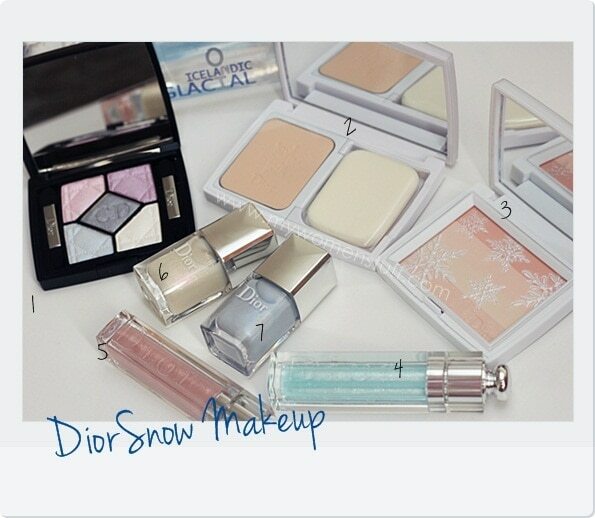 There are some new items in the Diorsnow range to complement the existing products. These new items will contain the Icelandic Glacial water. After cleansing your face, you are to use the Diorsnow White Reveal Wipe Off Gel (RM155) which acts as an exfoliant and removes the dead skin cells to reveal brighter more radiant skin. Its a very light gel that you use with a cotton pad to wipe the surface of your skin. Then you follow up with the Diorsnow White Reveal Moisturizing Lotion (RM170) which leaves your skin with a cool feel. This is the “toner” step and helps add moisture to the skin. It comes in 2 variants 1 Fresh for normal combination skin and 2 Rich for dry skins. Follow that up with the Diorsnow D-NA Control White Reveal Day Essence (RM435) which is an essence/serum to brighten the skin and refresh and moisturise it. There is also the Night Concentrate which is a night version of this essence and is an existing product. 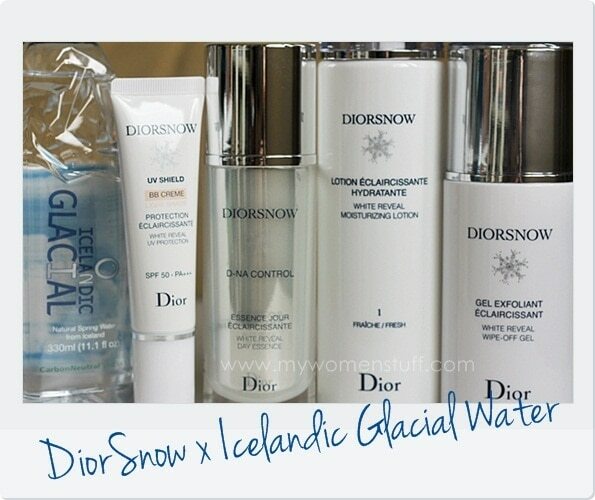 Other products in the range are the Diorsnow White Reveal Ultra Purifying Fluid (RM265), and creams and moisturizers which will likely be slowly revamped to include this glacial water. I recently experienced most of these new Diorsnow products in a special Diorsnow facial that I was offered to try, just to have a taste as to how the products felt on my skin. Cosmetics wise, in the newly revamped Diorsnow range also is a lighter version of the Dior BB Cream (RM175) (yay!) The colour tone is still a bit pink but it looks a bit lighter than the existing version. There are also 3 Diorsnow Makeup UV Bases with SPF35 PA+++ (RM170) that comes in pink (Rose Cristal), blue (Bleu Cristal) and beige (Beige Cristal). This is your regulation colour correcting makeup base, with pink giving you a more radiant look, blue to reduce yellowness and sallowness in skin and beige which is a tinted skin colour. Not to be missed is the new Diorsnow makeup range. Every year, Dior releases a makeup collection quietly under the Diorsnow range, which usually focuses on very light, shimmery, pearlescent makeup styles that may not suit every one or catch everyone’s fancy. It sort of gets lost between the Spring and Summer collections, which is a pity because they are always very pretty to look at! Strangely I have no interest about Dior products apart from the Dior Addict lippies hahahaha~ Thanks for sharing though, who knows, a lemming would spark in the future! Hmm… I don’t recall a powder cleanser in the range any more. Maybe its been discontinued? It does sound intriguing though! I like that wipe off gel thing although I’m not sure how sensitive skin will take to it. ooooh the blue lipgloss piqued my interest! 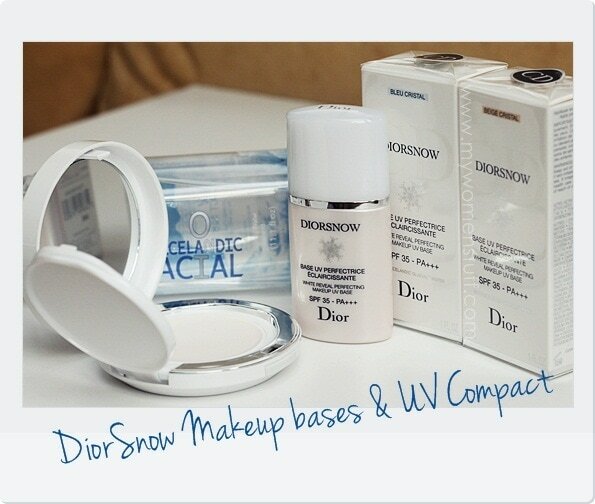 looks really cool (heheh), and i am lemming for the Diorsnow Light Amplifying Face Powder as well. the snow flakes just calls out to me. Haha I think the blue actually applies clear as does the pink! I think Xin has talked about the Amplifying Face Powder before and yes, I can’t imagine deflowering this either… gotta close my eyes and just get on with it! Lemming for the lip gloss. Any idea how much they are? Off the top of my head, they were RM88 before. I’m not sure if prices have gone up. Definitely! Summer is all year round here so might explain the appeal locally 🙂 But elsewhere, yes! definitely for the summer. OMG! 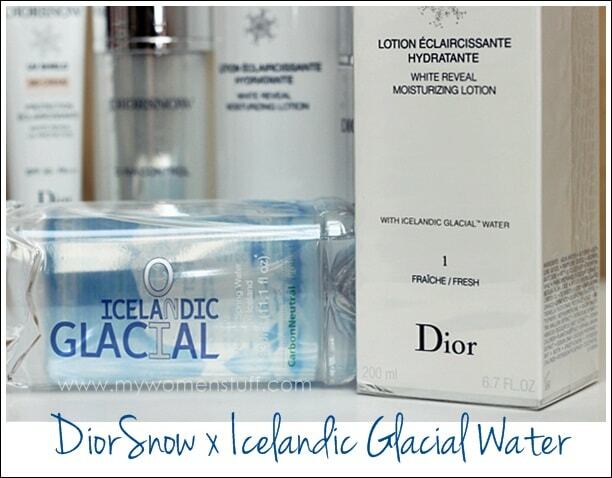 I’m so excited about the launching of the new Diorsnow products that are added with icelandic glacial water! 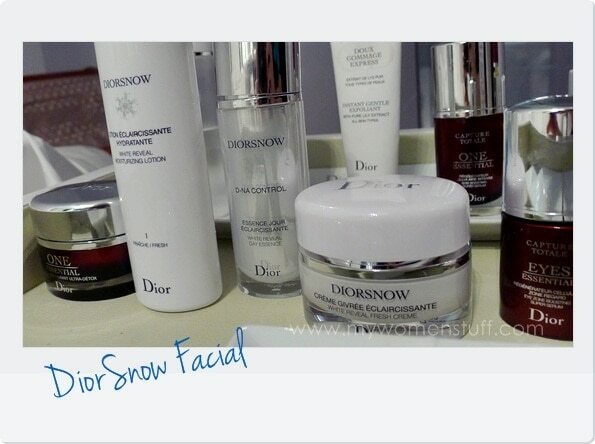 I’m a Diorsnow user since like 2 years already so I must say that all the products really works well with my skin. The effects are better because I use full range – from skincare to make-up. Last 3 weeks I got free samples from Dior counter. I got the Diorsnow White Reveal Ultra Purifying Fluid and Wipe Off Gel. It was good, especially the wipe-off gel. But the Ultra Purifying Fluid (works like moisturizer) make my skin drier, so I still stick with the old White Reveal Perfecting Emulsion. The Dior promoter told me that the purifying fluid works better with people with oily skin and large pores. So hard to get skin whitening ranges in Australia. Tried the new Jurlique one recently…but nothing happened…but then, it probably takes time. Totally loving the Diorsnow makeup range! Looks gorgeous!!! I’m so jealous, Paris! This Dior collection is so pretty..darned Asia exclusive! Haha. check out the swatch for the new and old DIorsnow BB Cream ! that is conflicting information because I have heard alkaline product is actually BAD for our skin. It is the same reason why soap is bad for our skin because they’re too high on the pH scale. And most products nowadays are pH balance to match our skin acidity which is around 4.5-5.5 I think. When we disrupt the pH our of skin, it makes it harder for the skin to fight inflammations, but the skin will eventually adjust its pH to its original level anyhow. Not to discredit you or anything, I just thought that the view of this post is quite contradictory to what i have learnt, but I might be wrong and willing to learn more.